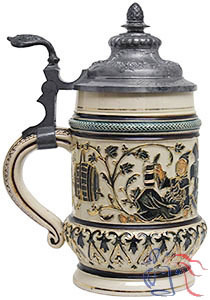 Pottery or stoneware master stein, threaded relief, 2.0L, pewter lid. Same model number applied to 0.25L and 0.5L drinking steins with varying text. A “Landsknecht” was a feudal serf used for military purposes by his master. These “soldiers” were often traded between landowners and were, in a sense, the equivalent of modern mercenaries, with the important difference that they were not free to choose their employer. 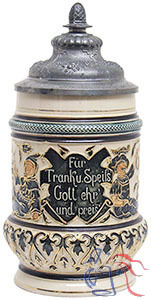 Copyright © 2006-2019 Beer Stein Library — All rights reserved.